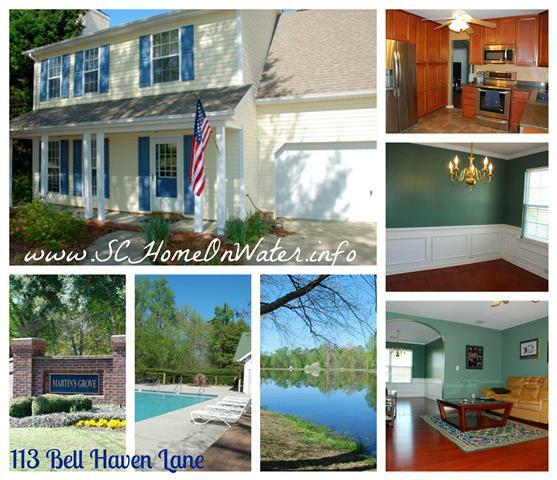 113 Bell Haven Ln in Lexington SC is For Sale! So you love the water...but can't quite afford Lake Murray yet? 113 Bell Haven Lane is the dream home for you then! Located in the heart of Lexington SC, in the Martin's Grove Subdivision (off of Park Rd), this home offers the serenity of daily water views as it sits on the Martin's Grove pond! This beautiful setting is stocked with fish (catch and release) for the residents of the Martin's Grove community! There is even more though...this subdivision offers other fantastic amenities to enjoy, including: a pool, a cabana, a playground, basketball court, park area and walking trails (great for pets too!) Check out this home today and don't miss this great opportunity to own 113 Bell Haven Lane in Martins Grove in Lexington! This sunny little house at 113 Bell Haven Lane has great space with 1900 square feet! It is a 2-Story home with 4 bedrooms (all upstairs) and a 2-Car Garage. One of the first things you will notice when you walk into this home is the beautiful laminate flooring! There is no carpet in this home! A sweet little front porch leads into a nice foyer area with waiscoting and molding. Arched entryways and continued laminate flooring lead into a large Great Room and Formal Dining Room. There is a gas log fireplace in the great room. The formal dining room is also a perfect size with wainscoting and crown molding. All ceilings are smooth and there are 2' blinds up on windows throughout the home too! The foyer or the formal dining room flows into a breath-taking Kitchen. This kitchen has been completely remodeled by the current owners with new cabinetry, beautiful Silestone quartz countertops and stainless steel appliances! There is tons of cabinet and countertop space...every inch is used wisely! There is even a built-in quartz table to fit 4 bar stools with storage underneath and above! The kitchen leads to a huge, multi-level back Deck to sit and enjoy the water views at any time of the day! Between the kitchen and foyer are a laundry room and downstairs half bath. Upstairs the Master Bedroom has a vaulted ceiling, private bathroom and his & her closets. The "Hers" closet is a huge walk-in! The private master bathroom has a long, double vanity, a garden tub and separate shower. There are 3 other bedroom upstairs. The 4th bedroom is a over-sized bedroom as it is the Finished Room Over the Garage! 113 Bell Haven Lane has been nicely maintained and has a termite bond and offer a 1 year Home Warranty to any purchaser. Contact me today to set up a showing! SEE ALL HOMES LISTED IN LEXINGTON SC HERE!